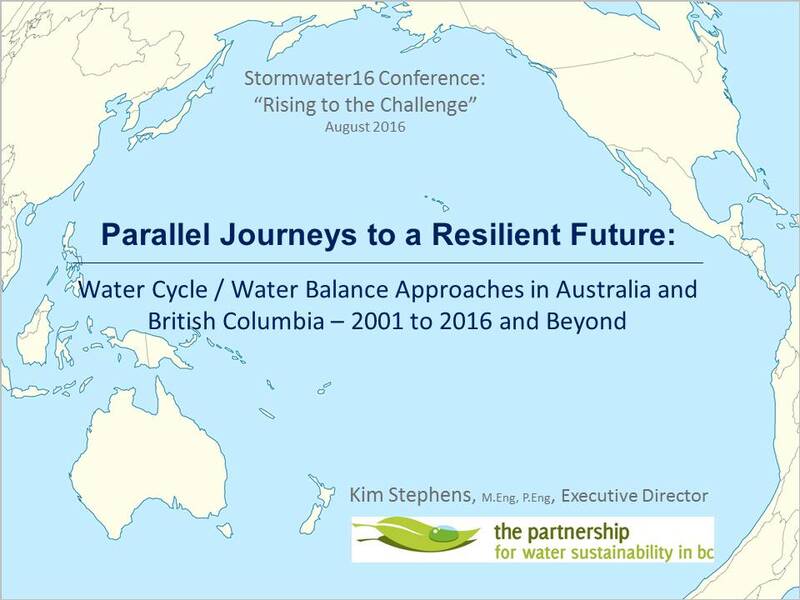 In November 2015, Stormwater Australia invited Kim Stephens (Partnership for Water Sustainability in British Columbia) to be the primary keynote speaker at Stormwater16, held in August 2016 in Surfers Paradise, Queensland. Click on Parallel Journeys to a Resilient Future – Water Cycle / Water Balance Approaches in Australia and British Columbia – 2001 to 2016 and Beyond to download a copy of his Keynote Abstract. Written in March 2016, the 4-page document is comprehensive in foreshadowing the scope of his presentation. In 2001, Kim Stephens was keynote speaker for a conference and workshop organized by a coalition of seven local governments in the Hunter Valley and Central Coast Region in New South Wales. The event was titled Challenges and Opportunities for Water Sensitive Urban Development. It was a seminal moment for cross-pollinating Australian and British Columbia experience, and for relationship-building. This has led to ongoing sharing and learning from each other. At that 2001 conference, Kim Stephens remarked on our parallel worlds and how they revolve around a shared vision for Water Cycle (or Water Balance) management. 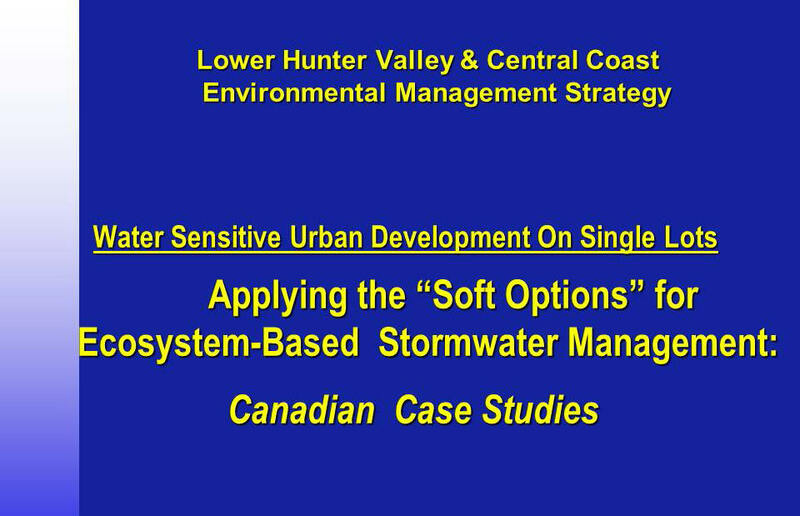 His keynote presentation at Stormwater 2016 was an opportunity for Kim Stephens to reflect on the parallel journeys of Australia and British Columbia during the period 2001 through 2016, and to look ahead. He explained how British Columbia is responding to the impacts of a changing climate, and he compared Australia’s “top-down” type of governance with BC’s “top-down & bottom-up” approach to implementing changes in water and asset management practices. “During the late 1960s, BC began its multi-faceted and ongoing journey towards sustainability. It has taken the past decade to begin implementing a policy, program and regulatory framework that makes ‘Water-Resilient Communities’ achievable,” stated Kim Stephens, Executive Director with the Partnership for Water Sustainability in BC. 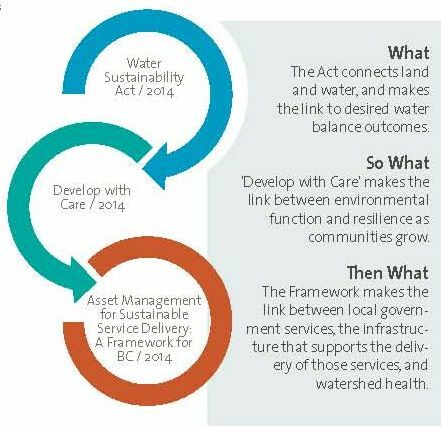 “A commonality of understanding between BC and Australia is that we are managing a water balance in a connected system of human endeavour and ecosystem processes. This is a shared discovery. Systems analysis of water balances is a key shared process. Integration of urban planning and water resources management is a key issue,” stated Dr. Peter Coombes when he reviewed the Keynote Abstract. Formerly the Chief Scientist for the State of Victoria, Peter Coombes is an Australian water champion and advisor to governments. Download Parallel Journeys to a Resilient Future – Water Cycle / Water Balance Approaches in Australia and British Columbia – 2001 to 2016 and Beyond to read the complete Keynote Abstract.